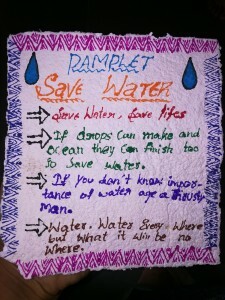 Janyaa > Enabling Innovation & Creativity > Success Story > Janyaa Success Story: Save Water Campaign! “I never knew that my campaign would have such an impact on the kids”, says Pranathi, a 8th grade student of Vani High School with her eyes beaming with confidence, while she talks about her “Save Water Campaign”. 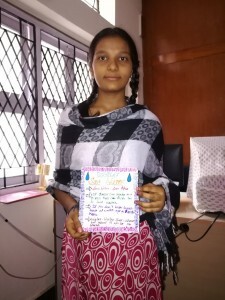 She prepared pamphlets and stuck them on the notice board, walls in rooms and behind doors in bathrooms, in order to create awareness and inspire a behavioral change among kids. “At first, they made fun of me. But I stuck to it. And now I can see them keeping the taps off while brushing their teeth, putting the shower off, while putting soap on, during a bath”, her smile depicting the success of her campaign.